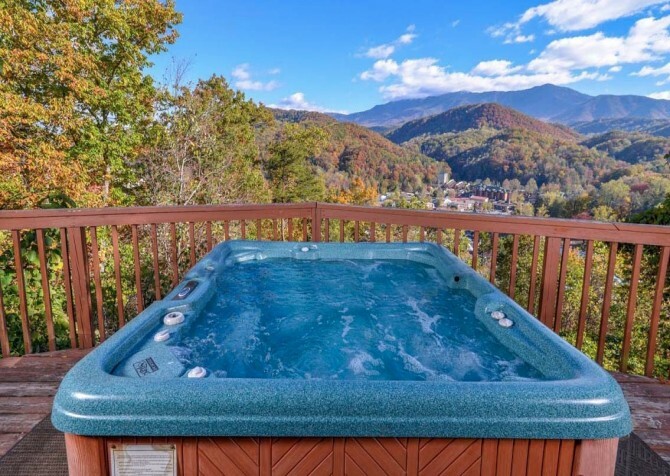 Absolute Heaven blends the best of all the things you love about getting away to the Great Smoky Mountains: awesome mountain views, the twinkling lights of the city at night, taking some time to yourself, exploring Gatlinburg, and playing with family and friends. 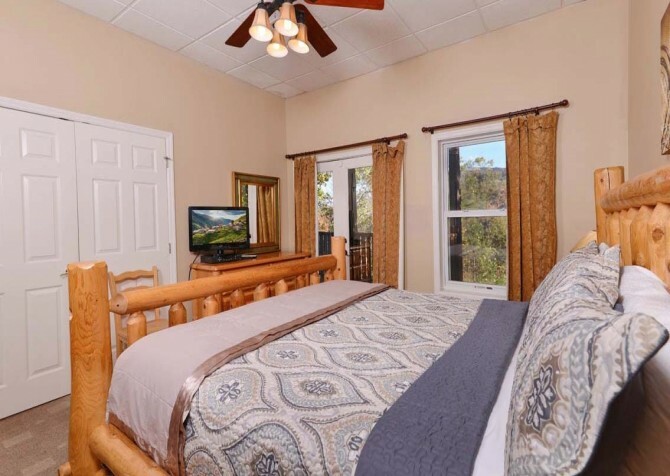 It’s furnished with the conveniences of home – from a fully equipped kitchen and dining table for 10 to high-speed wireless and a washer/dryer – along with fun extras like pool and foosball tables, an outdoor hot tub, and decks overlooking the city. When you want to relax, Absolute Heaven boasts 4 master suites, each with its own TV and en suite bathroom. Offering privacy and mini retreats within the cabin, the bedrooms are the perfect setup for several couples, multiple families, or a group of friends wanting a mix of privacy and shared spaces to hang out. 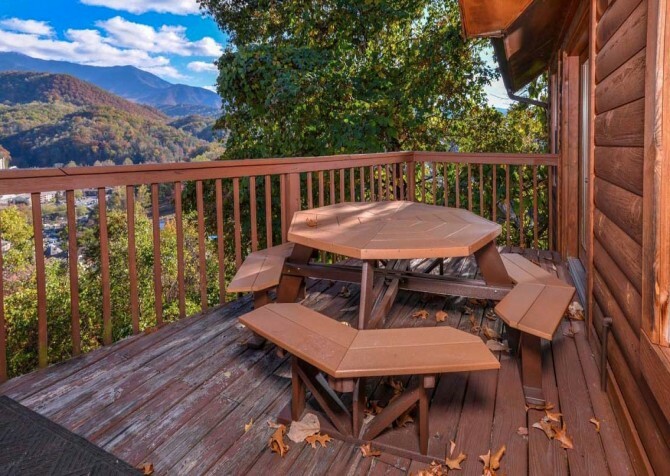 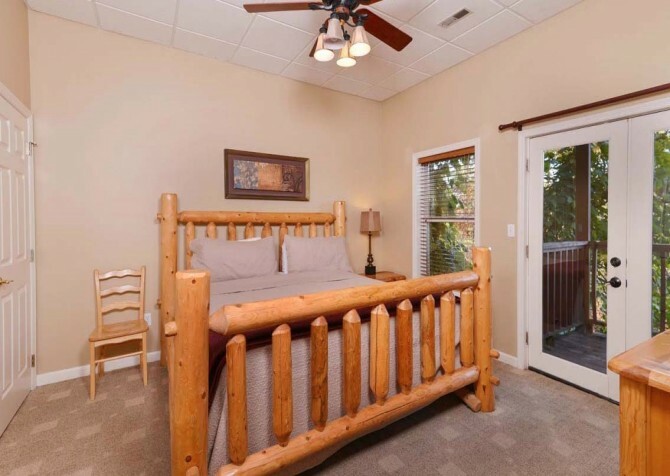 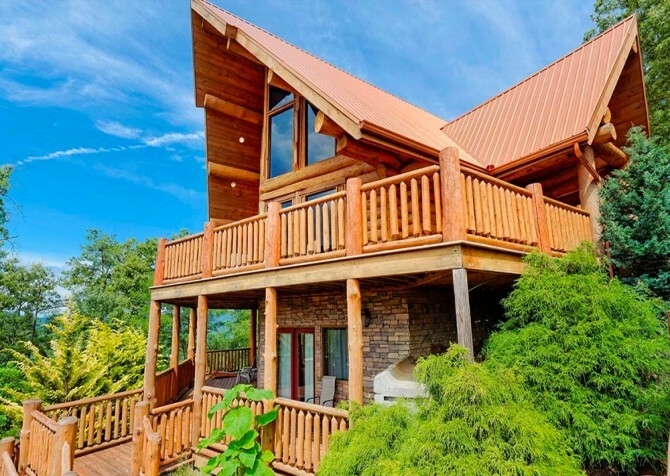 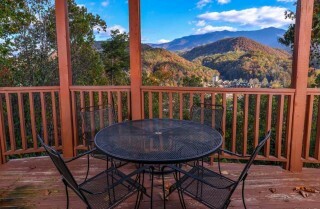 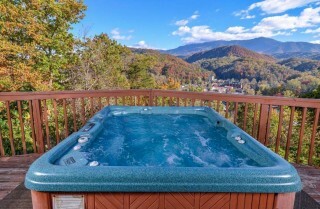 On top of it all, this Gatlinburg cabin is just minutes from downtown and the Great Smoky Mountains National Park, so it’s just a quick drive to restaurants, shops, attractions, and outdoor fun in the national park. A Smoky Mountain getaway isn’t complete without a night (or rainy day) spent cozied up in a beautiful cabin. Absolute Heaven’s living room is comfortable and inviting, with leather sofas, a coordinating chair, and a stacked stone fireplace with a big screen TV mounted on it. Retreat here to read, relax, and hang out. 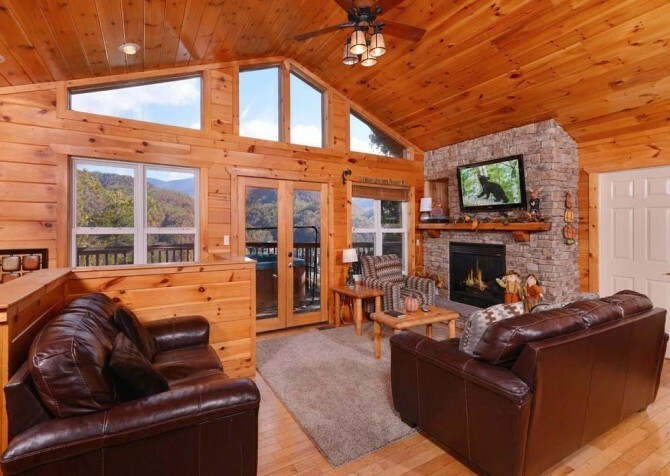 You can flip on the TV for shows or ball games, but the spectacular views will keep your attention. Large windows frame the beautiful views here, where you can watch the Smoky Mountains go from bright green in spring and summer to rich hues of red and orange in fall – and become blanketed with fresh white snow in winter. 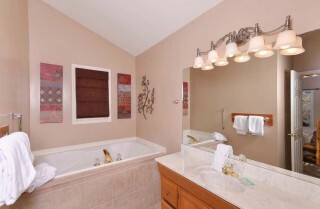 The living room, located on the entry level, also offers some extra privacy for guests. Two of the bedrooms are located on this level, separated by the living room in the center. 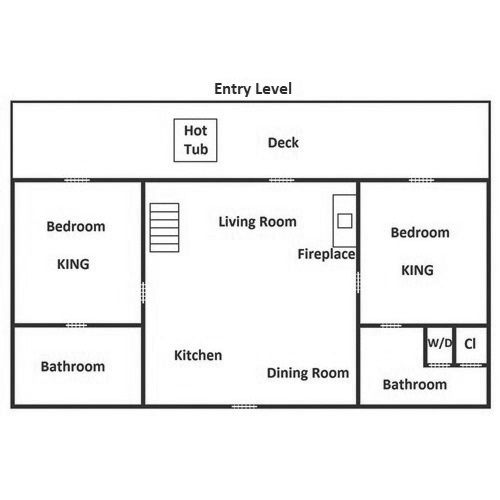 The layout and open floorplan of the living room and kitchen really make the room the perfect gathering place for groups. 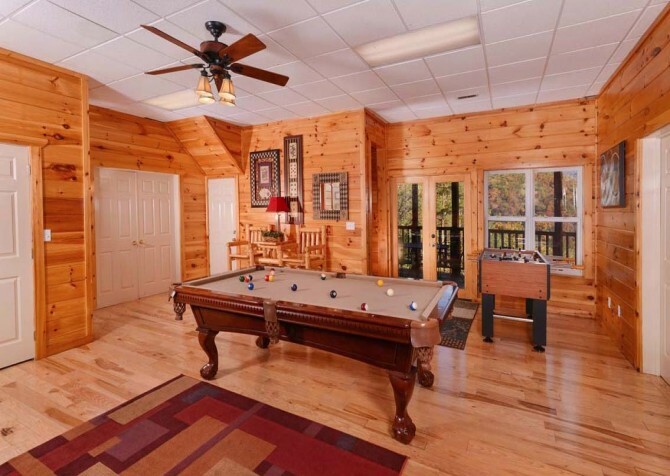 When you’re on vacation, it’s nice to have some of the conveniences you enjoy at home. In Absolute Heaven, you’ll have a fully equipped kitchen where you can store leftovers, keep snacks and drinks, or make meals for the group. 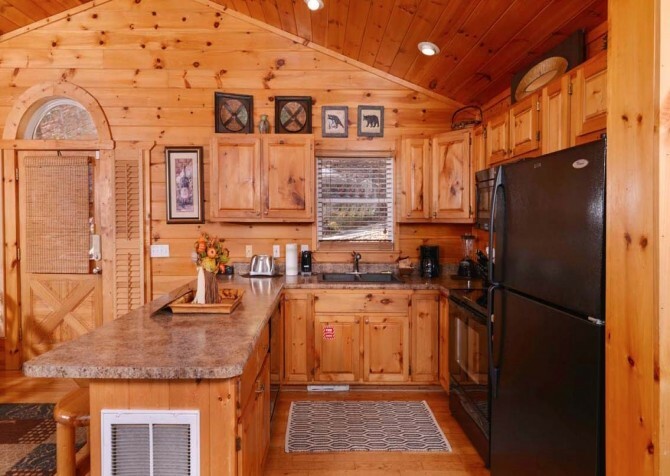 It’s furnished with a refrigerator, dishwasher, stove/oven, and built-in microwave, along with countertop essentials like a toaster, blender, knife set, and coffeemaker. 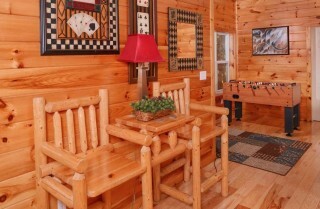 Kids can sit at the bar for breakfast (with 3 log stools), or you can set out a buffet of food for game day. 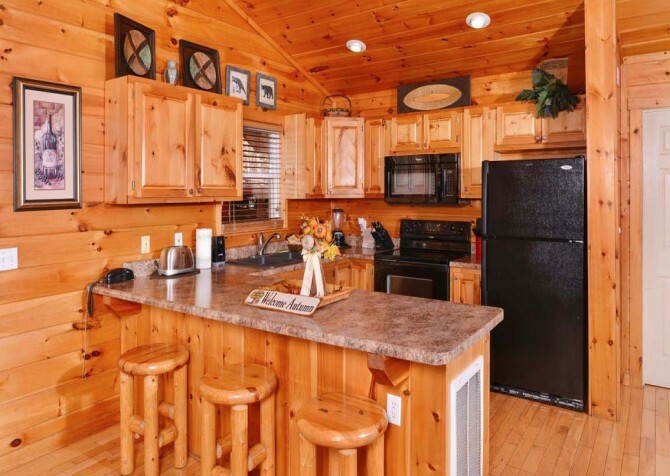 There are dozens of restaurants to choose from downtown, but if you want to save some money or make your own favorites, having your own full kitchen is a major perk. Even if you’re eating downtown, it’s nice to have a place keep fudge and caramel apples or leftovers. Vacation is all about quality time with family and friends, and your own dining room makes that even easier. 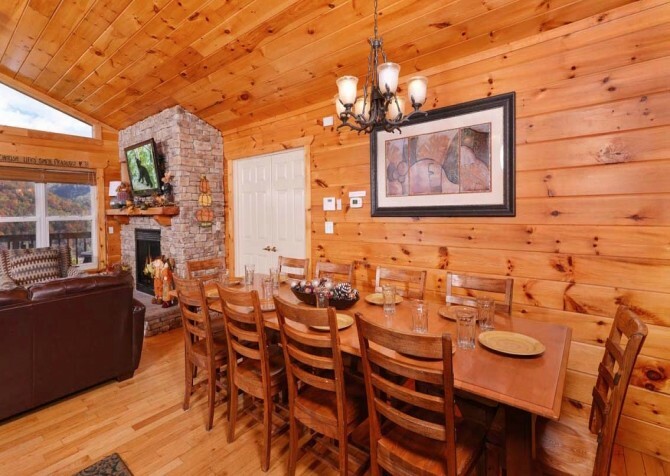 Whether it’s the holidays, a special occasion, or just a nice night to stay in, you can enjoy homemade meals in your own dining space. 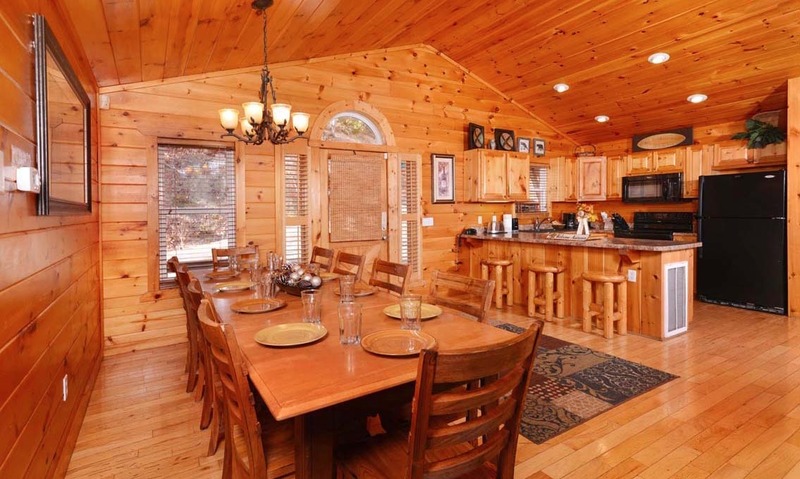 Sit down at a table for 10 (with more seating at the breakfast bar) in your all-wood space for a classic log cabin dinner. 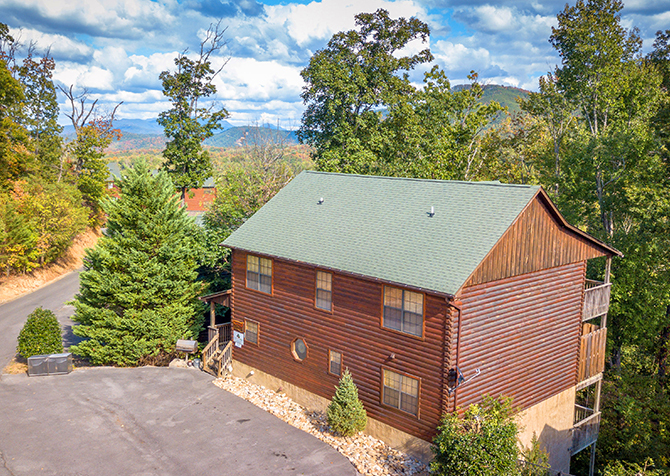 You can bring your own recipes, visit our blog for recipe ideas (especially around the holidays), or pick up pancake and biscuit mixes, jams and jellies, and more at The Old Mill or The Apple Barn in Sevierville, TN. Several area restaurants also offer catering (or grab takeout) when you want a great meal in the cabin without the work. For multiple families or couples planning a fun weekend together, Absolute Heaven’s 4 master suites are the ideal setup. 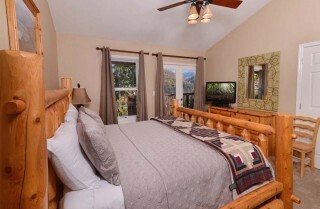 All 4 bedrooms are master suites, featuring king-size beds, their own bathrooms, and their own TVs. The stylish spaces are modern and simple – with a touch of Smoky Mountain charm – complete with conveniences like dressers, nightstands, and lamps. 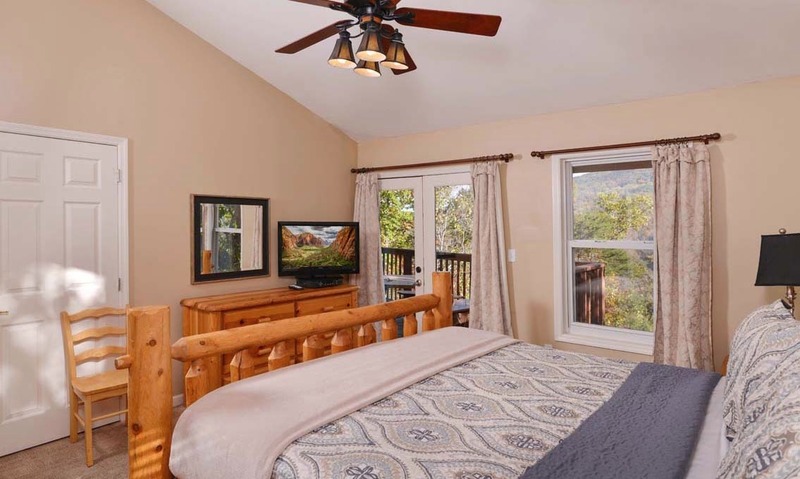 Each bedroom also has a mountain view, so every guest can wake up to the beautiful sun-drenched mountains in the mornings and fall asleep to the stars twinkling over the rolling hills at night. 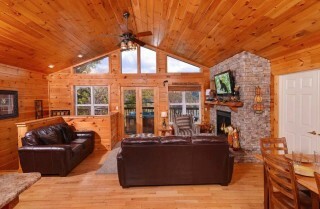 On the main level, the 2 master suites are separated by the living room in the center. 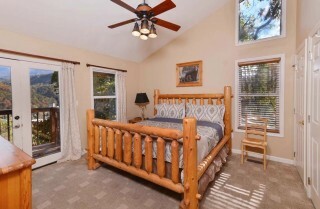 On the lower level, the other master suites are separated by the rec room. 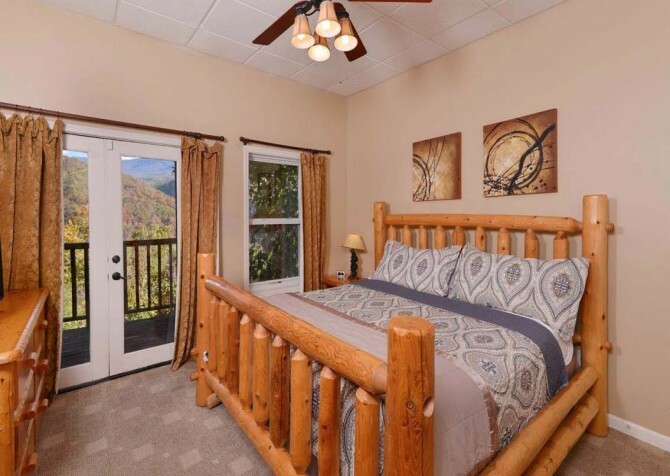 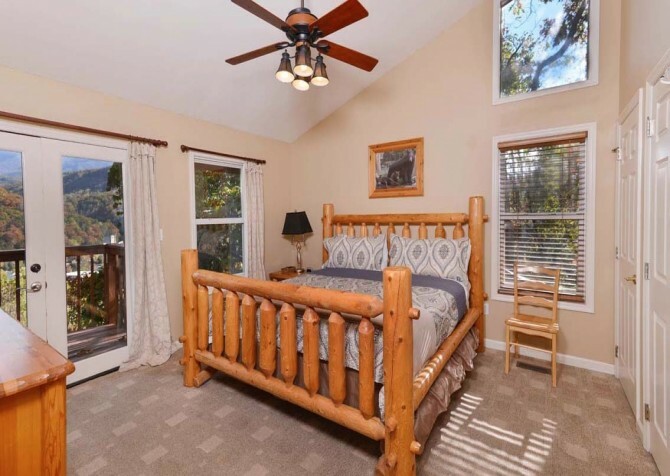 With bedrooms on the outsides of the cabin, and 2 on each level, guests will get even more privacy in this Gatlinburg cabin. They’re like retreats within a retreat! 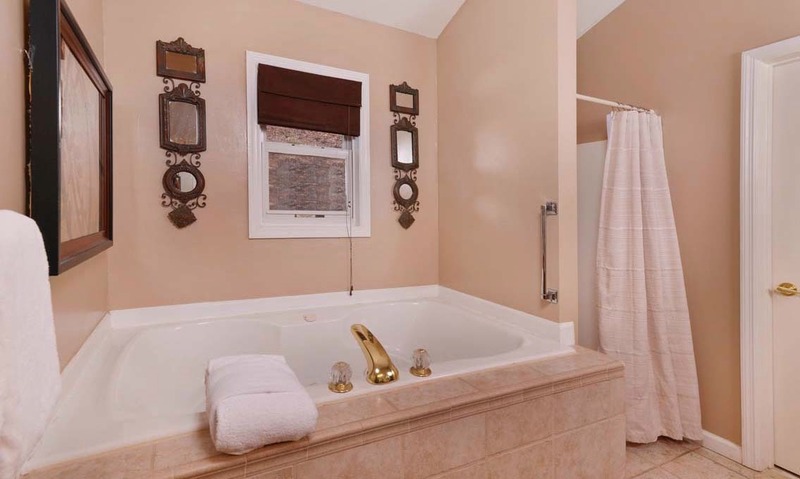 Two bedrooms even feature jetted tubs for relaxing soaks. 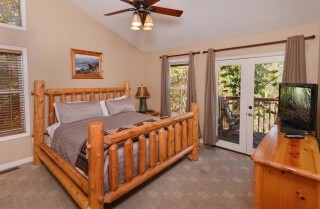 The cabin also offers 2 sleeper sofas for a little extra sleeping space. Absolute Heaven was designed for really living, from eating and relaxing to resting and playing. 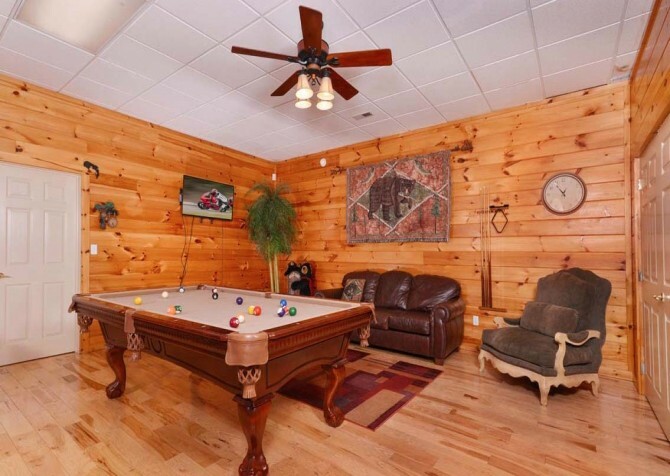 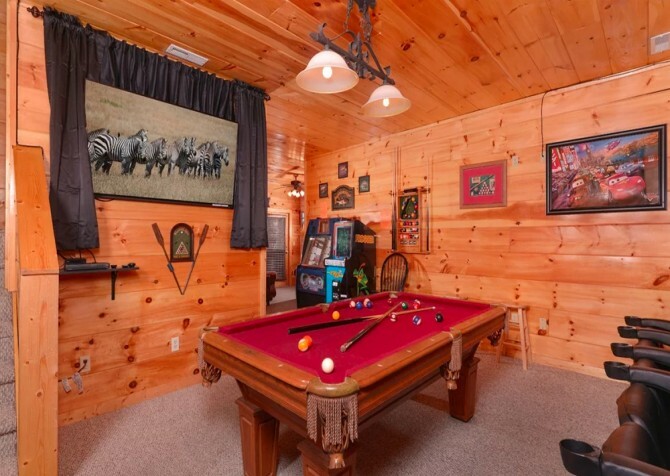 It features a great rec room where you’ll stay entertained for hours when you want to hang out in the cabin. Play pool, challenge someone to foosball, or just flip on the flatscreen TV and lounge on the sofa. 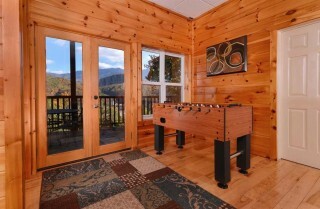 And, true to form, Absolute Heaven gives you more of those great mountain views while you play here! 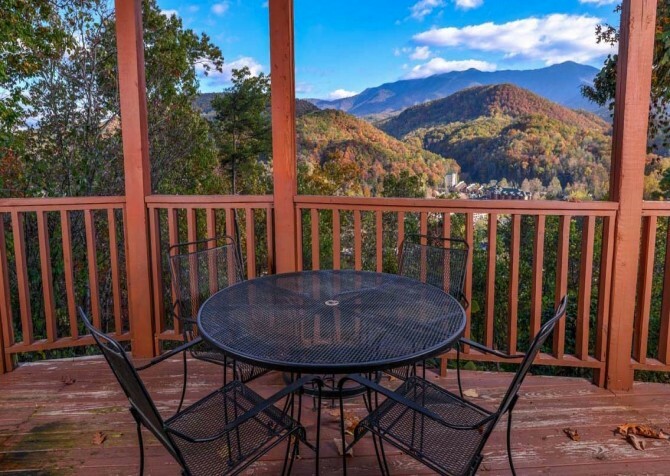 Absolute Heaven gives you the best of both worlds: a short drive to Gatlinburg and awesome views of the mountains and downtown. 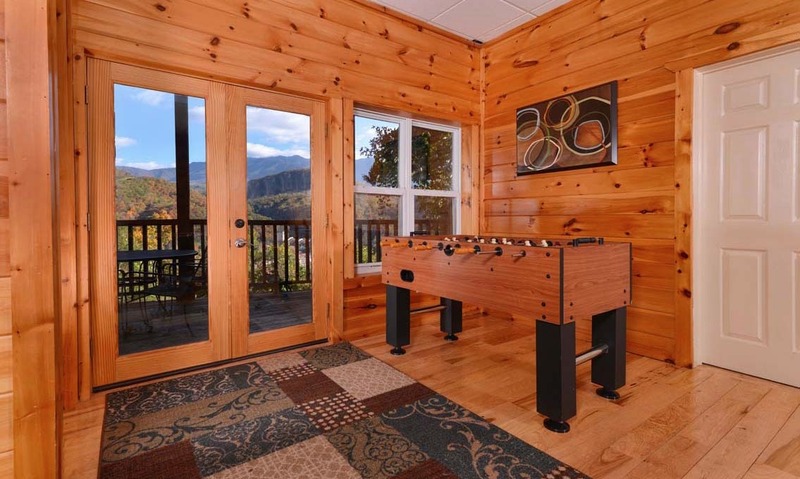 Whether you’re lounging on the couch, playing pool, or sleeping in, you can enjoy those beautiful views inside. But even more incredible views await outside, where you can have outdoor meals at the picnic table, have a cup of coffee in the rocking chairs in the morning, or climb into the hot tub and unwind. 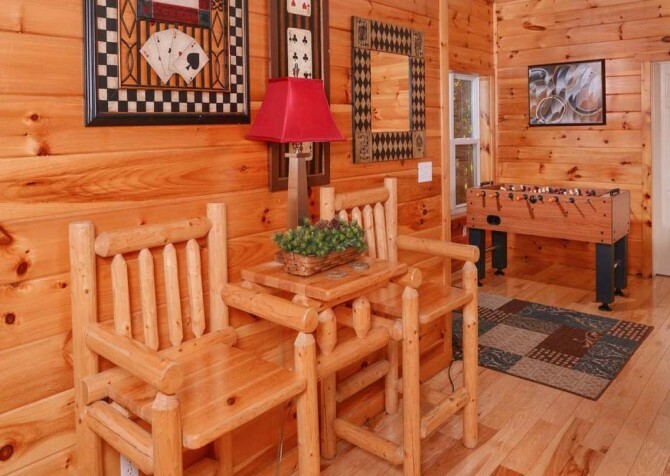 You’ll also have a charcoal grill, so you can have a cookout on a nice day. Grab some kabobs, burgers, or steaks in town and spend the evening grilling, hanging out, and playing at the cabin. And for easier arrivals, Absolute Heaven has a paved parking area. 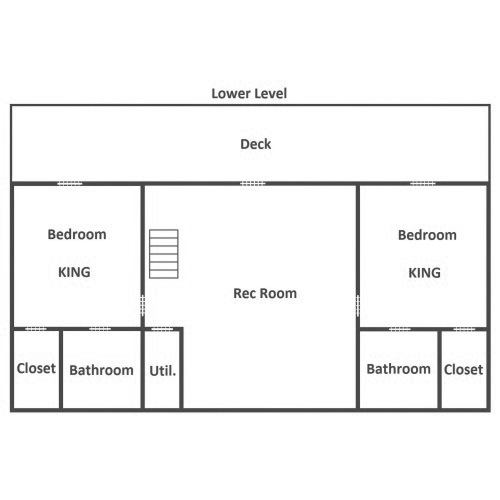 Still have your favorite classic movies on tape? Bring them along to watch in the VCR! 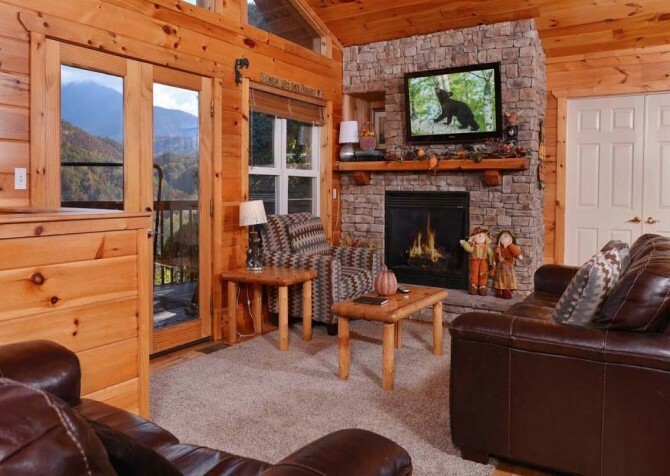 The kids can bring their favorites for the DVD player, and everyone can have a movie night in front of one of the big screen TVs. 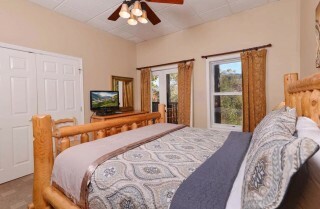 Longer stays are made easier with a washer/dryer (just pack light! ), and everyone can stay connected with the high-speed wireless in the cabin. Less than 4 miles from Absolute Heaven, the Great Smoky Mountains National Park has hiking trails, biking, horseback riding, picnic areas, historic buildings, and countless scenic views. 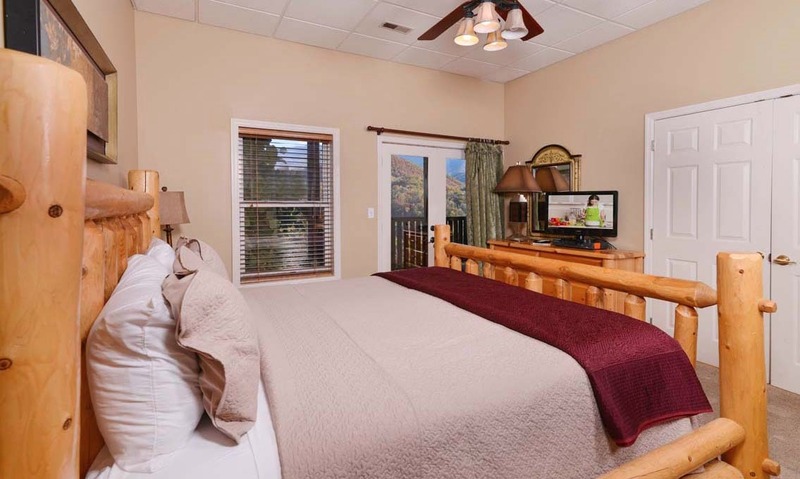 Ride the Aerial Tramway up to Ober for skiing and snowboarding in winter or outdoor fun like the Alpine Slide and kids’ play area in warmer weather. 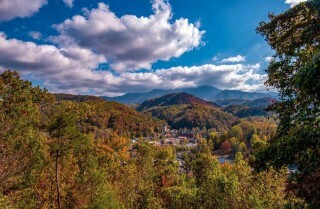 It also has shops, restaurants, and the annual OktOBERfest in fall. Gear up for a day on the trails (or in the water) at the Nantahala Outdoor Center. 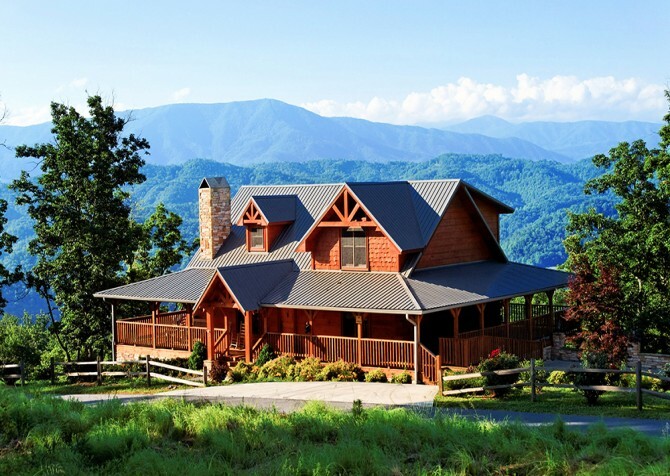 This huge store has everything from kids’ clothes, books, and toys to hiking boots, top outdoor brands in clothing, and outdoor accessories. "We have stayed here multiple times, and the staff was always friendly and helpful. 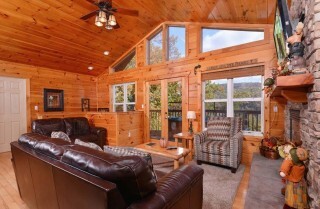 The cabin Absolute Heaven is where our family stayed multiple times, and we love it. We have also stayed at smaller cabins as well, and we enjoy that your cabins are always super clean, updated, and your staff is friendly." 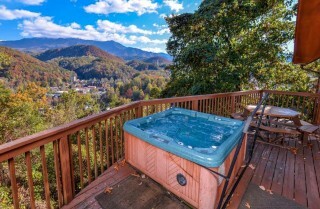 "Amazing experience, great view and worth every penny!!!!! Definitely will do again."